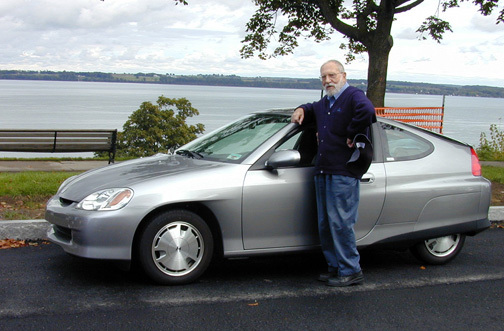 In spring 2000, Lindsay, ever indulgent of and easily wooed by pioneering technology, took possession of one of the early Honda Insights in the Phoenix area. At one point I has flown out to Santa Clara, California, for a conference and Dad drove up to hang with me. I spent much of the time witnessing at traffic lights and the very occasional gas station his proud lectures to any interested gawker. 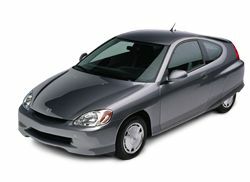 "It's a Honda Insight, a hybrid. . .the first gasoline-electric hybrid vehicle to be sold in the United States. Using an innovative 3-cylinder gasoline-electric drive train combined with an aluminum body, aerodynamic design and ultra-low emissions technology, the Insight breaks the 70-mpg barrier -- the world's best fuel economy for a gasoline automobile. It meets California's Ultra-Low Emission Vehicle standard and can travel 600-700 miles on a single tank of gas." . . .Or words to that effect. Dad loved to report the overall average MPG he'd achieved on his latest cross-country trip. It was a fascinating science project of a car. . .economical but limited to two 150-pound people and one suitcase.